A precocious anti colonial movement had emerged in the Philippines at the end of the 19th Century. To a significant degree, this precocity reflected the declining power of Spain, which had already lost its South American empire to Creole nationalists. Named after Felipe II, the Philippines were the last acquisition of the Spanish Empire and in many respects an imperial sideshow. The indigenous Filipinos lived in small communities called barangays under datus or chiefs. There were no armed states for the first Spanish colonists to contend with so ‘conquest’ was a slam dunk. The Spanish made their fortunes not by exploiting natural resources like spices or tin but from the ‘Galleon trade’ with China. Chinese silks and porcelains were exchanged for Mexican silver to be sold for immense profit in the Americas and Europe. Although Islam was making inroads on the southern island of Mindanao, Buddhism and Hinduism were unknown. Most Filipinos that the Spanish encountered were animists, and ripe for conversion by the Church. Spanish missionaries achieved spectacular results: today, 90% of the population is Christian. Clerical colonists did more than convert Filipinos on behalf of the Celestial Empire. They established huge haciendas which began pioneering commercial agriculture. Although the fathers forgot their vows and fathered an army of children with local women, these haciendas remained the property of the Orders, and were not passed on to the marginalised descendants of their founders. The Church also tried to convert the local Chinese, who were known as Sangleys, from the Hokkeinese sengli, trader. They had little success with the first generation. But many of the next, that is to say the offspring of the Sangleys who had married local women, as well as the children of other inter ethnic unions eagerly embraced the faith. These mixed race Mestizos evolved into a distinct ethnicity with its own customs, costumes and coiffure. When the British occupied Manila in 1762, as a consequence of the European Seven Years War, the Chinese Sangleys welcomed them with open arms: they hated the avaricious Spanish. Two years later, the British abandoned their allies and the Spanish took violent revenge. Many were killed and expelled; Chinese immigration was banned. The Mestizos adroitly took over the Sangley economies, infiltrating the old Chinese trading networks. Others bought land from the Spanish. When the Spanish Empire finally collapsed in 1811, the ban on the Chinese was lifted, and British and American entrepreneurs began opening the Philippines to international trade with the establishment of Cebu City and other ports. Rather like Malays, the Mestizos found themselves out competed by European and Chinese business acumen and energy. They retreated to the countryside – and Anglo-saxon capital followed in their wake. On the near empty island of Negros, for example, British entrepreneurs built a sugar factory in 1857 – but it would be managed by Mestizos from Panay and Cebu City, who had given up the struggle with the new Chinese companies. The acquisition of land transformed the Mestizos into a powerful, wealthy new class who lived on their estates in the grand manner of a nouveau riche. This new class began demanding an education for its sons and daughters. And it was from this educated Mestizo world that the first nationalists would emerge. 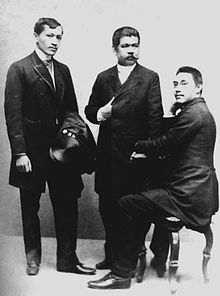 Calling themselves Ilustrados (enlightened ones), they would become the first conscious Filipinos. The title of the ‘First Filipino’ in a singular sense belongs to nationalist martyr José Rizal, who was born in 1861 to a family of prosperous hacienda farmers who embodied all the mixed streams flowing through Filipino history: Chinese, Japanese, Spanish and indigenous Tagalog. The family name Rizal was adopted following a decree by the Spanish colonial government. Rizal, it is believed, was ambivalent about his Chinese ancestry. In the course of his short life, Rizal was a poet, novelist, ophthalmologist, historian, doctor, and, as Benedict Anderson puts it, ‘political dreamer’. On 30 December, 1896, Rizal was executed on the Bagumbayan Field (now Rizal Park) by a firing squad made up of native soldiers under Spanish officers. His last words, allegedly, were ‘consummatum est’: it is over. Rizal grew up against a background of violent revolution and counter revolution in Carlist Spain which sent seismic tremors shuddering through the Philippines. In 1868, the ‘Cortes Generales’ led by General Juan Prim ousted the reactionary old order and forced the abdication of Queen Isabella II. The Generales’ regime despatched a new, liberal governor to the Philippines Carlos Maria de la Torre who was greeted with cries of ‘Viva la Libertad!’ He immediately granted new political rights to natives and mestizos outraging the old colonial guard. After two years ‘La Gloriosa’, the Spanish Glorious Revolution collapsed, provoking a furious counter revolution in Manila. 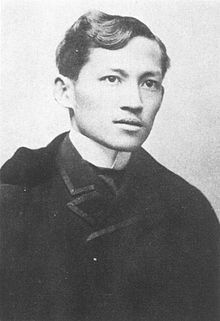 The Rizal family was implicated in these upheavals and José fled to Spain to continue his studies. He travelled all over Europe, to England, France and above all Germany picking up French, German and English with ease. Rizal admired the new unified Germany, and spent a great deal of time in Heidelberg, the picturesque university city where he studied ophthalmology. It was in Berlin, where he is commemorated with a small metal plaque, that he completed his novel ‘Noli me Tangere’ which dramatizes with astonishing vibrancy the complex strata of a decaying and fragile colonial society. The novel became the manifesto of a rapidly emerging Filipino nationalist movement. When Rizal returned to Manila in 1892, he threw himself into forming ‘La Liga Filipina’ to campaign for relatively modest social reforms. ‘La Liga’ was banned by the nervous government and Rizal himself branded an ‘enemy of the state’. He was a moderate compared to the man who would lead the anti colonial revolution a few years later. Andréas Bonifacio was a poor, self educated Manila artisan who had enjoyed none of the social advantages of the author of ‘Noli me Tangere’. Bonifacio’s secret revolutionary organisation, modelled on the Freemasons was called in Tagalog Kataas-taasan, Kagalang-galangang Katipunan ng̃ mg̃á Anak ng̃ Bayan (The Highest and Most Respectable Society of the Sons of the People), shortened to Katipunan. (Filipino rebels were called Katipuneros.) Spanish was spoken by a tiny elite; using Tagalog was intended to broaden the appeal of the new movement – even though it was not comprehensible to all Filipinos. At a secret meeting, Bonifacio tried to get Rizal to pledge his support for the revolt he was planning to unleash against the Spanish government. Rizal refused, arguing that to take such a step was premature. This was a bitter setback for Bonifacio who nevertheless went ahead with the ill prepared uprising in August 1896. The Spanish had been battered by the 1895 revolution in Cuba, and although Spanish troops easily quashed Bonifacio’s rebels in Manila, the Katipuneros waged a much more effective campaign in the rural provinces. In 1899, the Spanish threw in the towel and a Republic of the Philippines was proclaimed. By the time the free peoples of the Philippines celebrated the first national revolution to oust a colonial power in Southeast Asia, both Rizal and Bonifacio were dead – the former shot by a Spanish firing squad, the latter executed by the leader of the new republic General Emilio Aguinaldo. The revolution and the Republic of the Philippines was short lived. Its leaders, like Aguinaldo, had no purchase on the Muslim south; they faced new revolts led by religious lunatics and fanatical disciples of Bonifacio. The mestizo generals fell to carving up power between themselves. Then in 1898, American President McKinley, goaded by the reactionary newspaper magnate William Randolph Hearst, went to war with Spain, cynically expressing support for her oppressed colonial peoples. The Americans smashed the Spanish fleet in Manila Bay; American troops seized Manila. At peace negotiations in Paris, Spanish negotiators hoped to retain some of the Philippines, but the Americans insisted that ‘to accept merely Luzon, leaving the rest of the islands subject to Spanish rule, or to be the subject of future contention, cannot be justified on political, commercial, or humanitarian grounds. The cessation must be the whole archipelago or none. The latter is wholly inadmissible, and the former must therefore be required…’ The Spanish Queen-Regent Maria Christina finally agreed to American demands, against the wishes of the Cortes. The cost of acquiring the Philippines to the American government was a mere 20 million dollars. Yankee imperialism crushed the nationalist dreams that Rizal had imagined with such brilliance in his novels.